M. Aurelius Numerianus was the younger son of the Emperor Carus. After the death of his father in A.D. 283, Numerianus was acknowledged as joint Emperor with his brother Carinus. Obverse: M AVR NVMERIANVS NOB C, Radiate, draped and cuirassed bust right. Reverse: MARS VICTOR, Mars advancing right, holding spear and trophy, C right. Reverse: ORIENS AVGG, Radiate and draped bust of Sol right. Obverse: M AVR NVMERIANVS NOB C, Radiate, draped, and cuirassed bust right. Reverse: VICTORIA AVGG, Victory standing left on globe, holding wreath in right hand and cradling palm frond in left arm; below, captives seated to left and right; A in left field. Obverse: M AVR NVMERIANVS C, Radiate, draped and cuirassed bust right. Reverse: PRINCIPI IVVENT, Numerian standing left, holding globe in right hand, scepter in left; KAS. Reverse: PRINCIPI IVVENTVT, Numerian standing left, holding baton and sceptre; KAS. Reverse: PRINCIPI IVVENT, Numerian standing left, holding baton and sceptre; KAD. Reverse: PRINCIPI IVVENTVT, Numerian standing left, holding globe in right hand, scepter in left; SKA. Obverse: M AVR NVMERIANVS NOB C, Radiate, draped bust right. 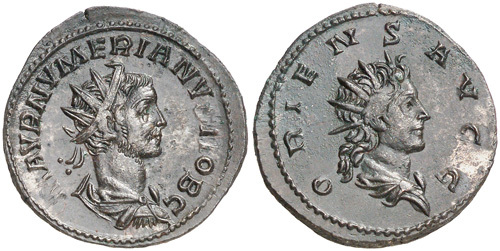 Reverse: PRINCIPI IVVENTVT, Numerian standing left, holding globe in right hand, scepter in left; KAS. 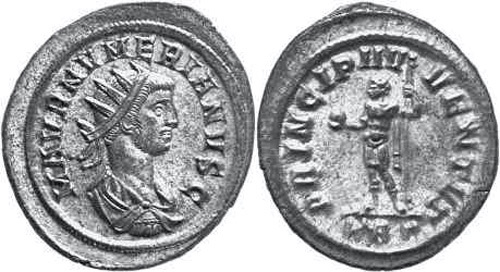 Reverse: PRINCIPI IVVENTVT, Numerian standing left, holding baton and sceptre; VIXXI.